Extra help is needed for our monthly serving at the soup kitchen. We are scheduled to serve the fourth Tuesday of the month at the Salvation Army, from 10 am to 1:30 pm . Our next scheduled date is Tuesday, February 26th. For more information, please see Nancy Henry or Phil Ulrich or call the office at 947-0156. Attention all knitters, the Prayer Shawl Knitting Group is meeting on Wednesday February 27th at 1 pm in the Parish House Oratory. All are welcome to join, both experienced and those who are looking to learn how to knit. Join us on March 3rd for a special Mardi Gras Potluck celebration to enjoy your favorite decadent treats before Lent starts and as we welcome back Mother Rita and say a fond farewell to Father Jonathan. Following the 10 am service we’ll be joining together for a potluck meal or dessert in the Undercroft, so please plan to bring your favorite dish to share! We’ll also have games and activities planned, so you don’t want to miss it. Please join us for “Exploring Spiritual Practices” on March 3rd following the Potluck and March 10th at 11:45 am in the Chapel, when we will be learning more about Chanting the Psalms. How will you observe a Holy Lent? Begin with Ash Wednesday. St. John’s will be offering 3 services on Ash Wednesday, March 6th. The 7:30 am service will be held in the Bethlehem Chapel. The 12:15 pm service and the 7 pm service will be held in the church. Begin Lent with prayer and repentance on one of the holiest days of our church year. Extra help is needed for our monthly serving at Second Saturday, hosted here in the Undercroft. We are scheduled to serve next on March 9th from 11:30 am - 1:30 pm. No need to sign up in advance, or even commit to coming monthly, just stop in to help out when you can. For more information, please see Nancy Henry or Phil Ulrich or call the office at 947-0156. Join us for the Sunday Afternoon Inquirers Group in Lent: Sundays at 1 pm in the Back Lounge of the Parish House at 234 French St. Meeting March 10th, 24th, 31st, April 7th & 14th. The inquirers group is open to all, especially those interested in learning the beliefs and practices of the Episcopal church, or those having questions and concerns regarding the Christian faith. The group meets to discuss a book together and there will be time for individual and group conversation with Mo. Rita about joining the church. This year’s book will be : Good News of Jesus, by L. William Countryman. Within the church and outside of it, people today are in a period of refocus and rediscovery, asking what is really central to the Christian faith. Countryman shows that at the heart of Christianity stands the figure of Jesus and the message he embodied - The Gospel. Introduction to Islam : Former parishioner Bill Voss and representatives of the Islamic Center in Orono will introduce us to the teachings and practices of Islam. Learn about one of the world’s great religions. Get to know your Muslim neighbors. Thursdays in Lent - March 14th, 21st, 28th, & April 4th in the Parish House Bangor Room. Soup and bread served at 6 pm; Presentation begins at 6:45 pm. Save the date! The Spring Rummage Sale will be held on Saturday, April 27th! Late last winter Mo. Rita began to talk with me about her sabbatical leave and her hopes for the congregation and vestry during her absence. At that time I could not have foreseen what would unfold over twelve months. Nor could I have imagined how quickly time can fly when we are busy and engaged. It seems that it was only a few weeks ago that I spoke with Dave and Andrea Saquet about Amelia‘s baptism on All Saints Sunday, that Ruth joined the choir on a snowy night when rehearsal was canceled, or that I realized that I couldn’t type at Mo. Rita’s workstation. By the way, I adjusted the keyboard and screen so that I could “hand and peck“ type; and now I can’t return it to its former position. My ministry as your presiding priest is coming to an end at the same time that you continue to craft a response to this congregations challenges. As you re-engage this work with Mo. Rita, I thank you for your prayers and support. I believe it to be a blessing to serve among you and to be part of your ongoing conversion. I thank God for Sarah, Chris, past and current vestry members who have stepped up to great responsibilities. Their time and efforts have maintained St. John’s mission. I cannot name everyone who has touched Ruth and me; in part, because I still do not know everyone’s name and in part, because many of you have done so behind the scenes and out of sight. I do thank you. We will pray to God for your ongoing, vital work, for your beautiful worship, and for the spirits encouragement when you feel overwhelmed or confused. God blesses you with everything you need to worship in spirit and truth. To view an electronic copy of the Feasibility Slideshow presented on Sunday, February 17th, please click the above photo. 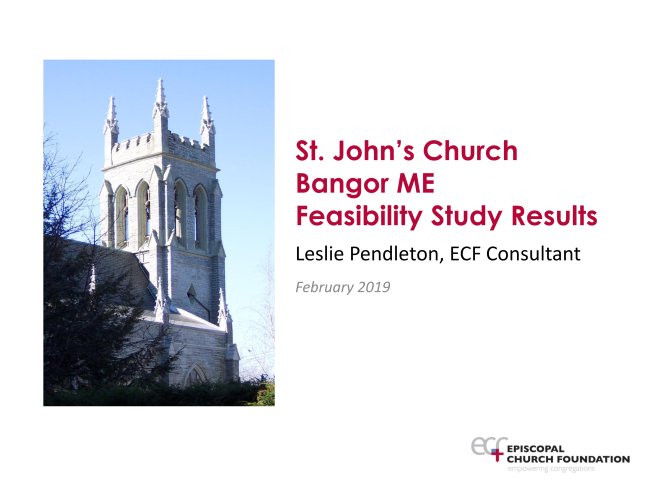 On February 17, at the conclusion of the 10 am service, Leslie Pendleton of the Episcopal Church Foundation (ECF) reported out on the parish’s capital campaign feasibility study. The church began the discernment phase of the capital campaign in the spring of 2017 with a series of cottage meetings. The October 2017 observation of cracks in the buttresses of the tower resulted in a study of the structural integrity of the church by Ames Associates. The firm’s September 2018 report on the condition of the tower and the overall church building confirmed critical structural deficiencies which would cost an estimated $1,529,000 to fix. After listening to parishioners’ responses to the Ames Associates report, the Vestry chose to contract with ECF to undertake a Feasibility Study, which tested the church’s ability to raise a portion of the $1,552,500 needed to repair the critical structural deficiencies and to fix some problems with the stained glass windows. This was completed through a survey which included printed and emailed surveys in January of this year. Ms. Pendleton reported that the surveys yielded a strong 38% response rate, and that 91% of respondents were in favor of the project described, albeit with some reservations. 75% of respondents were willing to contribute to a campaign. ECF predicts that St. John’s could raise $429,000 from parishioner contributions alone, which would leave more than $1 million to raise from sources outside of the parish. Ms. Pendleton reports that it is rare for churches to be able to fully fund capital campaigns through internal sources alone. Sixteen survey respondents committed to working on committees to research, write, and apply for the grants that would be needed to fill in the remaining $1.1 million gap. Ms. Pendleton warns that there are no national bodies offering grants to fix Episcopal churches, and that most Episcopal churches she works with have found that their secular neighbors do not tend to contribute heavily to capital campaigns. The fundraising would need to be from grant sources that would support us for other reasons. A copy of the report can be requested from Vanessa Young, Parish Administrator. This newsletter article does not comprise a complete report on the Feasibility Study, the February 17 report, or the discussion of parishioners that day. The Vestry strongly favors open communication between and among parishioners about this. Please communicate with the Vestry, through any member, to ask questions and to share information, suggestions, and concerns. "As you are well aware, the church is not immune to the sins that beset every human institution. The news frequently carries stories of improper and abusive behavior on the part of clergy, a great deal of which is coming to light in response to the activism of victims, the #MeToo movement. The Episcopal Church has made great strides over the last generation in educating clergy and lay leaders about the maintenance of personal boundaries and the responsibilities we share to protect the most vulnerable from harm. But we are not exempt from bad behavior. There are far too many instances of sexual misconduct in our church. At last summer's General Convention, The Episcopal Church suspended for three years the statute of limitations for reporting and addressing sexual abuse and misconduct by clergy against adults. (There is no statute of limitations for sexual abuse and misconduct committed against children and other vulnerable persons.) Beginning January 1 of this year and continuing to December 31 of 2021, any victim may report incidents of abuse and misconduct to the diocesan intake officer for consideration and response. The Diocese of Maine has two Intake Officers: the Rev. Michael Ambler, priest and Canon to the Ordinary, and Ms. Elise Magnuson, a lay member of St. Luke's Cathedral experienced in working with persons affected by abuse. (Their contact information may be found at the end of this letter.) Persons wishing to report sexual abuse and misconduct, as well as other sorts of clergy misconduct, may do so by reaching out to either of them by phone or by email. The intake officer will respond to you directly." It continues with explanations, theological reflection, and an invitation to anyone who has been hurt by the sexual abuse or misconduct by a clergy person. Copies of the complete letter are available HERE and at St. John's Church Office. Mark your calendar - On Tuesday, March 5 (Shrove Tuesday) our SR. 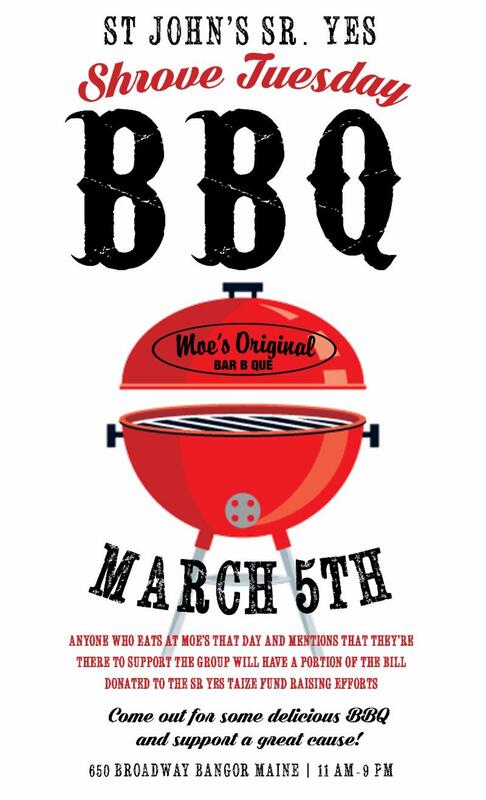 Yes group will be receiving a portion of the profits from sales at Moe's BBQ, at 650 Broadway in Bangor, all day. This money will go toward our 2021 pilgrimage. Our youth will be there in the evening, but sales from lunch also contributes to the total earned. Just let them know you are there to support St. John’s when you place your order. Thank you! Our Jr. YES group has baked cookies for the Meals Ministry and done some meditative coloring. Sr. YES continues to work through our confirmation curriculum, exploring our beliefs. This week we looked at The Lords Prayer in depth and through different senses and experiences. We’ll be having lunch with our mentors this coming Sunday. Both youth groups are planning for our summer mission trip to Cambridge, scheduled to begin June 19. We’ll be coming home a little earlier than usual to participate in the ordination of our new bishop and in a diocesan youth overnight. A tubing trip is being planned for March 2 at 12 at Hermon Mountain, weather dependent. Cost is $15; scholarship money available. This trip is open to all middle and high school students in the parish. Please contact Anne-Marie at youth@stjohnsbangor.org to register and for more information. Sr. YES is sponsoring a SEED SALE. Order forms will be available in the coming weeks and will be available from Sr. YES members and also at coffee hour. The seeds are from FedCo, a Maine company, and are reasonably priced and good quality (I have bought seeds from them for many years—AMM). Our children have been working on a February unit on Compassion, learning about welcoming the stranger and about Jesus’ teachings about loving and caring for all. We have done some meditative coloring and also made valentines, both for some humanitarian workers on the border and for our homebound members. We continue to volunteer at Second Saturday and are planning another visit and service project related to our homebound members. Family take-home materials for Lent will be available on March 3 and will focus around the Way of Love. We hope to see you on that special day as we thank Father Jonathan, welcome Mo. Rita, eat our favorite foods and burn the palms for Ash Wednesday. I am hoping to plan some activities for families with our youngest members this spring, including a parent night out with youth provided (adult supervised) childcare. A group will be forming on Realm soon.